The Council of Europe, and the Press Council and Journalists Association of Bosnia-Herzegovina stage a major debate in Sarajevo on the role of the media in the country today. Since war erupted on the morning of 6 April 1992, numerous attempts have been made to foster a media culture of honest, non-partisan reporting in Bosnia-Herzegovina. Have they succeeded or are parts of the media still driving a wedge between the communities? Who sets the agenda? The journalists? The politicians and media owners? The audience? Who does the media serve and why? Are things changing with the rise of the online audience and citizen journalism? Could they change? "MEDIA IN WAR AND PEACE TIME : CAN WE DO BETTER?" 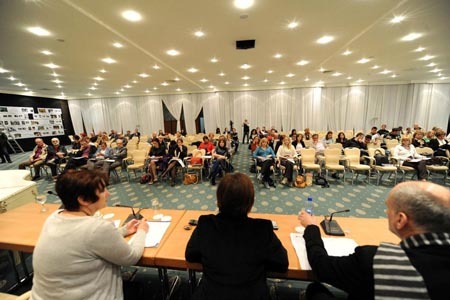 aims to examine all these questions, with contributions from a well-informed panel and an audience of local and international journalists, media experts, activists and others at the Hotel Holiday Inn, Sarajevo, taking place between 9:00 a.m. and 2 p.m. on 6 April 2012. Among those taking part will be: journalists and student journalists from around Bosnia-Hercegovina, representatives of the Bosnian Press Council and Journalists Association, journalists from two other post-conflict countries – Ireland and Lebanon – as well as a representative of Bosnia’s media regulatory authority. Attendance at the event is free. To register interest or learn more about the event, please contact Peter Cunliffe-Jones, deputy director of the AFP Foundation (peter.cunliffe-jones@afp.com).